Climate change and the debate around it have proved me wrong. Be it Theodore Beale, or Sarah Hoyt or a random publicity agent for the Koch brothers, there is a stratum of people who believe climate scientists are trying to control us all, or bring us to the dark ages, or are just deluded. People WANT to believe they don’t have to change. People WANT to believe untrue things if its advantageous for them to do so. (You don’t have to stop burning oil, it’s okay!). Ignore all the climate scientists are telling you. Keep calm and pollute on. Does every species end its civilization like this, in the throes of greed and self interest? 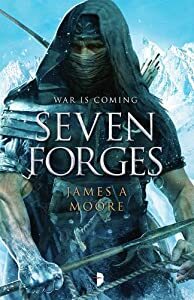 My thoughts on Seven Forges, an epic fantasy by James A Moore, from Angry Robot Books. The premise is all right: a descendant polity of an old empire exploring the blasted wasteland left by that prior empire’s fall. An expedition into that wasteland finds the unexpected–a culture of warriors living in, from their reports, a hitherto unknown lush valley in the midst of the wasteland. Their interactions are the hub on which the novel spins. There are a couple of good ideas here. The clash of cultures, first contact, misunderstanding each other, the interactions between the martial Sa’ba Taalor and the softer, more human Fellein feel authentic. Captain Merros Dulver as leader of the Fellein expedition gets far and away the best and most characterization in the novel. I also liked Desh Krohan, the foremost sorcerer in the Empire. I also liked the setting idea of a polity trying to reclaim the glory of a lost and destroyed empire it now (partially) occupies. However, a fair number of things made this a reading experience that didn’t work for me. Geography seems awfully fluid if not outright unclear. The review copy I had has no map and given that important plot points hinge on geography and the relationship between where things are and the implications of those physical relationships, that simply is inexcusable. Too, some events happen, especially a large event at the end, that are fired Chekov’s Guns that do not appear to have been put on the mantel piece in the first place. I am not a fan of all of the stylistic flourishes. While the sword and sorcery feel in an epic fantasy is certainly different and welcome, I am not certain that combining that with touches of third person omniscient, especially as the closeout of chapters, was entirely effective for me. Epic Fantasy can be ponderous especially in the opening pages, and even starting the novel with a physical conflict does not rescue this novel from that. Nor does some stylistic tricks with time and what the novel focuses on, although they do help. It takes a fair mile for this novel to get any real narrative momentum. And even then, there is a lot of setup and maneuvering that only really starts to get going in the denouement. Clearly the first volume in a series, there is nothing like a complete story in any of the storylines in Seven Forges. The novel simply stops. In the end, Seven Forges, although being a book I am clearly the target audience for, didn’t capture my heart and mind like I hoped it would. In between the release of his novels, Brian T McClellan has been filling in gaps in the history of his Powder Mage Universe by writing some short fiction. Hope’s End is the story of Captain Verundish and an impossible position. A loveless (and fraught marriage). An affair and a love that cannot bloom while that marriage remains in place. A child in danger. Oh, and yeah, and then there is the titular Hope’s End. It’s not the Captain’s position, but rather its a military tactic: a pell-mell, throw in all the chips near-suicidal attack against a fortification. In the PM universe, its a recognized technique and trope. For, General Tamas, too, you, see, has been put in an impossible position. Two impossible positions, two impossible situations, may both be saved by an act of heroism. Hope’s End is the story of that heroism, and what people will really dare to do when there is nothing left to lose. I’d have liked more background in the story, but the story itself is entertaining enough and worth its absurdly low price. I think it works better once you have read the novel(s), rather than reading this first, since many things are simply not explained and its assumed the reader will know them. This is a story to fill in a gap, rather than introduce you to the author’s work for the first time. Marissa chatted about Earth and alcohol. as her friend chewed the grain slowly. He took stalks of the ripe wheat from the bowl and chewed them one by one, letting his flat eyes watch Marissa as he listened. He tapped one of his hooves against the tile floor as if keeping time to music. What a strange biology, she thought, as she sipped her glass of water and tried to explain Prohibition to him. Domlas wasn’t buying or understanding the idea. It was incomprehensible to his species. How could you enforce it? But, then, she could barely understand how the United States of America ever expected to enforce it, either. Was that why it had fallen? She was admittedly fuzzy on the timeline of history. It would take the better part of a week of the grain he was eating to turn into alcohol, and then be absorbed into his system. Benefits, and disadvantages, of a two stomach biology, Marissa thought. Reardonist Sympathizers claim responsibility for explosion at warehouse of supplies for victims of Hurricane Isis. Reardonist Sympathizers have claimed responsibility for the destruction of a temporary warehouse set up for victims of Hurricane Isis in the American state of Carolina. Minor injuries are reported, but thousands of dollars of relief supplies were destroyed. Senator Taggart is a co-sponsor of the effort, with Senator Enderby of Deseret, of an Amendment to the U.S. Constitution that would devolve law enforcement within U.S. borders entirely to private entities. Seems like I’m blogging and posting stuff EVERYWHERE but here. Case in point “Mining the Genre Asteroid” is my new Skiffy and Fanty column. I look at old books that new and young readers should know about. Mike R Underwood, Stina Leicht and others have joined up to do S&F columns, too. Read them all! I’d just like to point readers at the header of this blog. “Living in the Science Fiction Present”. Way ahead of you, Mr. Ballard, but I agree completely. 1. A Libertarian (see: Libertarian) convinced of the belief that his or her society is in imminent brink of collapse, either minor or major. Apocalyptic Libertarians contend that only people such as they, and those who hold libertarian beliefs, are best suited to survive and weather such a collapse, or build a better society from it. The expected causes of such a collapse in the Apocalyptic Libertarian view are the actions of non-Libertarians, labeled as collectivists, Marxists or Communists despite any self-identification on the part of the members of such groups to the contrary.